Image: Soulscape: Sense of Place/Belonging. A landscape becomes a soulscape when there is a sense of belonging. Belonging is a feeling, an inner landscape, which may have nothing to do with physical surroundings. This group creates a soulscape. They’re kin; they belong together. They have come home. My paintings, drawings and sculptures flow from what moves me and from where I find beauty: women, animals, the earth, color, pattern and light. My art represents the deep connection I feel with these elements. Through my artwork I am envisioning and creating the world as I would like it to be: a place where harmony is present between animals and human. Image: Trust in the Infinite to Answer your Deepest Prayers in the Darkest Times. This artwork is about global warming. 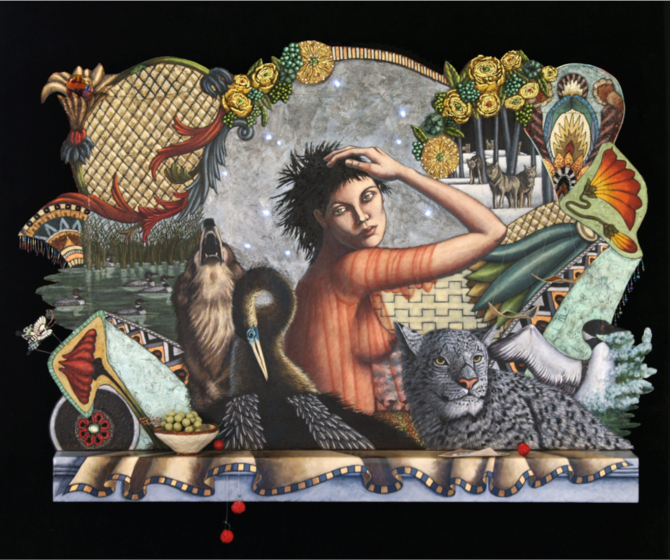 Many of the animals within this piece are endangered. There is a sadness. We are facing this bleak day together. The title is from lyrics by peace activist Snatam Kaur. In college I was introduced to feminism. I began to realize that the underlying slant of words and behaviors could be coercive and oppressive in its intention. Feminism challenged me, but I did not have real clarity until I read Mary Daly’s Gyn/Ecology: The Metaethics of Radical Feminism. Her work galvanized and synthesized historical events, making connections between them that I had not seen before, helping me understand that no choice is benign. At that point my artwork began reflecting my newfound awareness and beliefs, moving from creating classical figurative images of women to works showing them in all their diversity, shapes, colors and ethnicities. 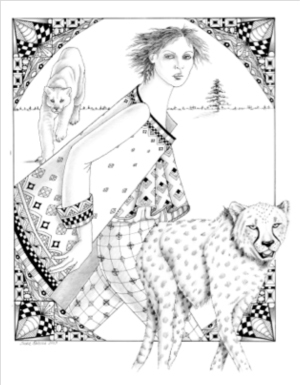 She walks into the sunset with her leopard companion, living each day to its fullest. My feminism evolved into considering that the oppression was not only of women, but included the abuse and neglect of animals and the earth. I began questioning the hierarchy of all living things, wondering why most humans believe they are superior to animals. When I am with animals I can feel their essence as sentient beings whose unique purpose deserves to be considered. It is a deep connection, both visceral and soulful. I have been calling animals kin for many years and actually feel a greater affinity with them than with humans. I don’t understand the inherent coldness and cruelty I see in people and feel safer surrounded by my animal companions and art. Image: The Art of Living a Fine Mingling of Letting Go and Holding On. We fear to let go too soon or to hold on for too long… the choice between the two is one of the great lessons of life. Our Lady of Guadalupe, queen among queens, enfolds us with maternal protection as we choose. There are times I feel a parallel existence. My life carries on with the quotidian – working in my studio, feeding my dogs, running errands, reading, going to the kitchen for food. The predictable. The usual. Simultaneously, I can feel the dry heat of the savannah where my kin, the elephants, are traveling to the next water or food source. I can hear the pounding of their feet, the earth trembling from their weight. Surrounding them are human predators who will take their lives for the ivory of their tusks, murdering their young or leaving them to die of broken hearts. They are not safe, these big majestic creatures. There is so much pain and sadness in this reality. I know all elephants carry this betrayal with them. I wonder how long it will take the collective to rid itself of the circus. This is just one species I am drawn to and care deeply about. Images have the power to affect the viewer’s mind and make them question the status quo. With my work I hope to portray a visual alternative to the world as it presently exists. My desire is to offer a world where there is a collective heartbeat and a soul. A world with no hierarchy, where there is equality and freedom, mutual respect, communication and understanding. Sudie Rakusin is a visual artist, sculptor, illustrator for authors such as Mary Daly, Carolyn Gage and Patricia Monaghan, and a children’s book author of the Dear Savannah Blue series. 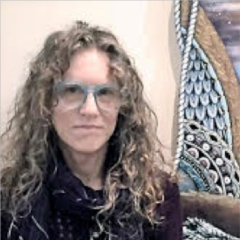 She is the owner of Winged Willow Press where she has used her original painting and drawings to create coloring books, divination cards, illustrated journals and more. She has also created the coloring app for iPad, Unwind Time. 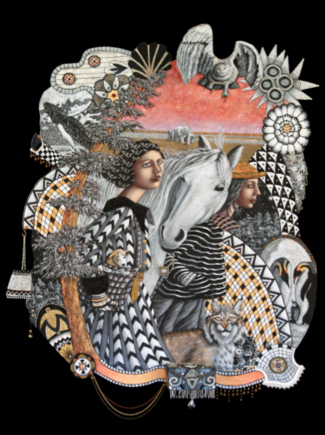 Sudie’s artwork includes 3-dimensional oil on canvas paintings, papier-mache sculptures and drawings. 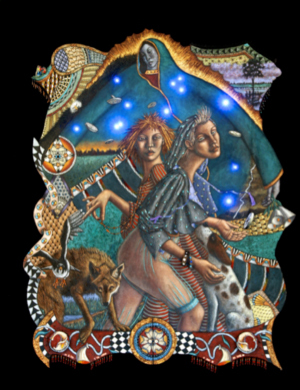 She currently resides in Hillsborough, NC, in the woods, on the edge of a meadow, surrounded by her gardens, with her Great Dane, Fiona Fig and Pitt/Boxer, Marmalade Moon. See more work at www.sudierakusin.com.